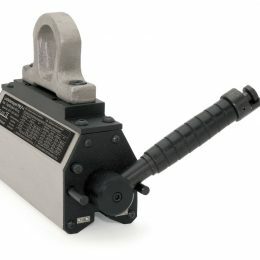 Lifting Magnets for Metal & Steel Work Pieces | UK Supplier, Rencol Automation Ltd. The D-PML-P lifting magnets are the professional solution for the handling of pipes and sheets. 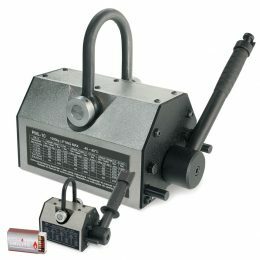 Equipped with a special magnet configuration the lifting magnets are particularly suitable for use in steel, container and pipeline construction. 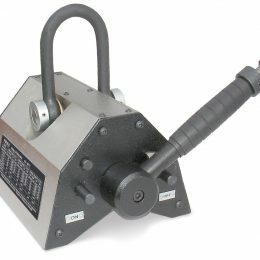 The D-PML-R lifting magnet range is perfect for the handling of round material. Equipped with an extra deep V-block, the magnetic field is guided deeply into the curved work piece, ensuring a secure grip even on items with poor surfaces. The DPML achieves excellent results both with large air gaps as well as thin and round material with a compact design and low weight. The device is tested by the German TUV Sudwest and offers outstanding robustness.